The Inaugural Basketball Spotlight Future Phenom Camp opened this weekend at the New 24 Facility in District Heights, MD. This event had loads of talent especially in the Class Of 2019. Next we will take a look at some of the top players from around the country that made their Spotlight debut. 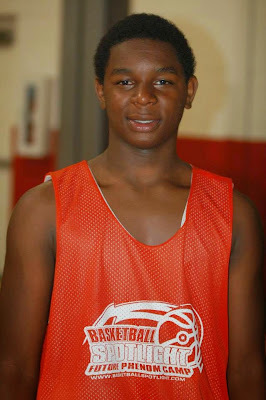 Marquise Walker Guard (Illinois)- Another top flight guard with national rep ripped up the Future Phenom Camp. Walker has been playing red hot all summer and this event wasn’t an exception. He shot the three ball with confidence and finished at the tin like a grown man. An added addition to Walker’s game is his post up play. Anytime a smaller guard attempts to check him he will take him on the blocks Gary Payton style. He had a few scoring flurries and hit a game winning shot during a heated contest. The Chi-town fire came out of this kid. 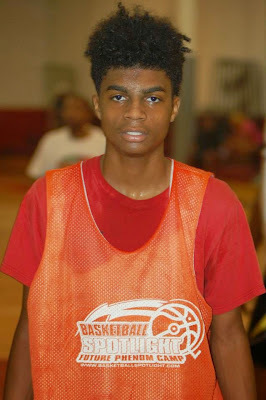 James Bishop Guard (Maryland)- The combo guard put up serious numbers at this camp including a game in the high 30’s. He gets it done off the bounce and scores it in a hurry. This type of event is not for the passive players so Bishop fits this mold well. The left reminds me of high scoring former NBA guard Cutino Mobley. His unique scoring ability guided his team to the camp championship. Mr. Bishop gets buckets and left as the camp’s MVP. Anthony Byrd Guard (Pennsylvania)- Byrd is a great last name for this guard because he flies when he has the rock. He has supreme quickness when penetrating and going east and west. He blew past defenders with ease and finished off plays with authority. Back peddling defenders in transition at his mercy when pushing the rock. He made it his business to ignite the flow of the offense and was always in attack mode. Isaiah Moseley Guard (Canada)- Moseley was one of the top scoring guards at this event. The Canadian product showed some serious explosiveness in the half court and in the transition. His physical frame made penetrating the lane very easy and he also showed the ability to get his teammates involved. At his point in his career this kid looks like he has the total package. James Lamareon Guard (Maryland)- This lefty gets end to end in a hurry. He has a point guard build but a scoring guard mentality. He’s capable of running off five buckets in a row in a heartbeat. He does need to be careful not to get out of control at times. He was one of the best finishers in the building. Cameron Savage Guard (Maryland)- Savage is a prototype old school point guard because he has a pass first mentality. His feel for the game turns him into a drive, draw and dish type of guard. He takes good care of the pill and doesn’t take many chances. The scorers on his squad had to enjoy playing with this unselfish floor general. On defense he was a ball hawk that was determined to turn over the opposing ball handler. Desire Dejean Guard (Maryland)- Dejean is a lanky floor general with good court vision and long arms similar to Rajon Rondo. The only different is this kid can hit the outside shot. I love his approach to the game because he doesn’t waste time trying to be fancy. He’s very fundamentally sound for his age. I want to see more of this kid.